30 MINUTE TREATMENT – One and Done! Our success rate is 100% using a controlled-air device combined with Ladibugs Natural products. Get rid of lice today with our Ladibugs professionals at our convenient Hopkins Clinic location. Over 60,000 patients seen and successfully treated in 10 years of operation. Considering today’s busy society and the fact children/teens are in crowded environments such as school or other activities where lots of kids congregate, it is no surprise head lice are still a problem today. Technology has only compounded the problem with the practice of taking “selfies” with cell phones, pictures in which kids’ heads are often touching. Whether you choose to get rid of nits using our safe products or our Ladibugs system, you can feel confident knowing those bugs are gone, while hair is protected from damage thanks to natural lice treatment. Our products have become top sellers in salons across the country, a fact in which we take great pride. This is a one time process that completely eliminates head lice in a single sitting, and does not require water, chemicals, shampoo, or any other potentially messy products. Simple and effective! At Ladibugs Hair Care we cater to clients in the Twin Cities area of Minnesota including Edina and the rest of the Minneapolis-Saint Paul metropolitan area, delivering exceptional results! Contact us today to learn more about our products and services.and helping prevent a re-infestation! 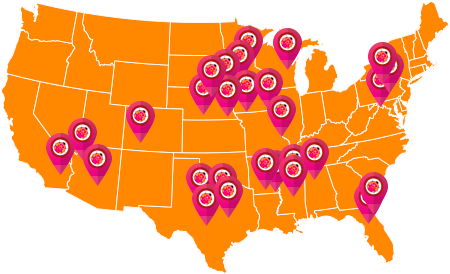 Find Ladibugs products in thousands of stores nationwide. Use the finder to locate the salon nearest you. Or buy products in our online store – available individually or in elimination and prevention kits. Find a salon near you! 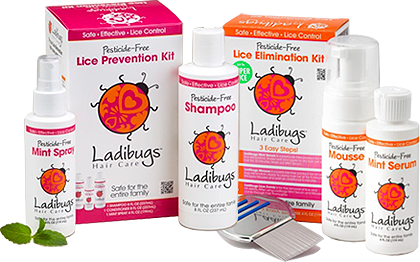 Ladibugs Hair Care began out of the need for two moms with children who contracted head lice at school to find a solution that eliminated toxic and potentially dangerous chemicals for the treatment of louses and their nits. As registered nurses, we put our heads together and decided to develop a plan and product line that is effective, and also pesticide-free. As a result, we now offer our hair care line which includes not only products to eliminate head lice, but those that also prevent infestations including shampoo, conditioner, mint spray, and more! We understand that head lice are uncomfortable, cause itching and even pain, and prevent children and teens from returning to school until the infestation is gone. Our non chemical treatments are extremely effective, and perfect for those who desire a one-time solution. Over the decades, many lice have become immune to the ingredients and chemicals contained in drugstore and over-the-counter products – ingredients that may include harmful pesticides. Why take a risk? The natural ingredients in our products are completely safe, however head louses find them offensive. Perfect for use in eliminating nits and helping prevent a re-infestation!